We had almost reached the point of saturation when it came to going out for pizza in the UK. Pizza Express, Ask Pizza and Pizza Hut had pretty much dominated the market and we became a little blasé with their offerings. Then, things changed. Pizza Pilgrims brought back a renewed enthusiasm to pizza with their spicy nduja toppings, and Pizza East helped make pizza-eating cool again. Not that it had ever really lost its zeal for the diehards; the chains just took away a bit of the sparkle. So it was with an open mind that we went for pizza at Radio Alice, named after the Italian 1970s pirate radio station broadcasting from Bologna, which acted as the voice of those unhappy with the governing status quo. The restaurant's ethos is, of course, much like the radio station's. Venn Street in Clapham Old Town is a busy spot with excellent footfall (someone has clearly done their research). We visited at lunchtime when diners were sitting under the glowing orange awning outside, soaking up the sun’s rays. Lightbulbs hung from the trees that would no doubt give the place a magical aura come nightfall. The restaurant layout creates intimacy—there are two separate rooms with their own entrance that lead into one another towards the back (as if two restaurants have been merged together). Exposed bricks line the walls with a turquoise border and bar. Deep red booths intermingle with wooden chairs and tables, and the pretty stained glass panes on the windows add an original touch. It’s premeditated rustic. After their repeated success with the creation of Berbere Pizzeria in Italy (their hometown of Bologna in particular), Italian brothers Salvatore and Matteo Aloe partnered with Emma King, co-owner of Gail’s Bakery, for their London ventures. 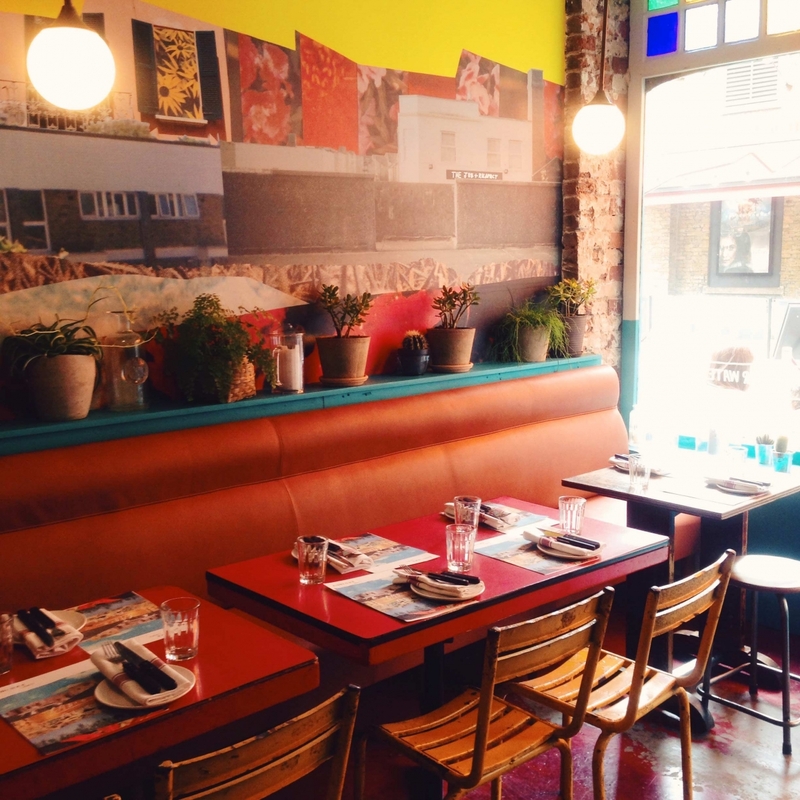 They opened their doors in Hoxton in late 2016 initially, and now south of the river in Clapham. If you're a purist when it comes to pizza, then this place is unlikely to appeal. However, if you're open to a new way of tasting pizza—but not in the annoying deconstructed sense—then you are likely to be a repeat customer. The Aloe brothers’ USP is organic stone-ground grains, mother yeast sourdough, and 24-hour-fermentation at room temperature. These make the pizza light, golden, soft and crisp. They also draw a strict distinction between what should be added to the dough before and after its time in the oven. The summer menu has two varieties of pizza to choose from—white base made with "organic creamy fiodilatte mozzarella" and red base with "organic whole tomatoes crushed with basil and oil". Each base then leads to a short list of options. The former has seven varieties and the latter, four. It made sense to try one of each, so we settled with the aubergine, tomato, smoked scamorza cheese and basil for the red base, and speck, gorgonzola, fiordilatte mozzarella, honey and walnuts for the white. Whilst we waited, we chose some green olives from the "piccoli" section to nibble on along with some rosemary and garlic oil to dunk the crusts of our pizza in. Crusts are so often discarded but options for tasty oils and butters on the menu renewed our enthusiasm for pizza crust eating. After a relatively short wait, both pizzas arrived at the same time and we alternated between the two. Round, and of a good size, they had already been cut up for us, which we agreed was appealing as it saved us the hassle. The "white base" pizza had the gorgonzola and fiordilatte mozzarella melting into a satisfying molten mess with fresh speck sitting on top, having been added post oven. Biting into each piece, there were elements of sweetness from the honey and the grain of little pieces of chopped walnuts. It was a marriage that worked far better than a typical "Quattro Formaggi", with the salty and sweet elements. The "red base" pizza had the aubergine medley placed on it post oven, having being cooked independently, but each piece had a generous layer rather than being scattered randomly. It worked, and both pizzas complemented each other, although the white base was the winner. The crusts did taste light and crispy as the restaurant's USP mantra states, and with the accompanying oil, there was no wasted crust in sight. Clever marketing maybe, but it was definitely a thoughtful addition on the menu. Radio Alice is not for purists who have preordained ideas of how pizza must be prepared, nor for the conveyor belt consumer of American hot. It was, however, an innovative reminder that this king of comfort food could be made to evolve without compromising on its soul. Opening Hours: Monday to Thursday noon-10.30pm; Friday to Saturday noon-11:30pm; Sundays noon-10pm.